Hl-Temp E.P. Grease is a new generation calcium-complex grease formulated to meet a variety of lubrication requirements. It offers superior extreme-pressure protection not typically found in other greases. Hi-Temp E.P., with optimum EP compounding prevents metal-to-metal seizure under high-load conditions and shearing forces without using heavy metals or other environmentally undesirable additives. 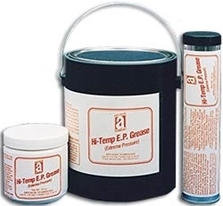 Unlike other calcium complex greases, Hi-Temp E.P. will not lose consistency or "set-up" during storage. Applications: Anti-friction bearings, oven conveyors, electric motor bearings, steel mill roller bearings, crusher bearings, high-and-low speed construction and agricultural equipment, wet or dry conditions, automotive.